Collectors often ask about the titles of Komarin paintings, or more specifically the relationship between the titles and the paintings intrigues many and questions often arise. As mentioned in assorted interviews and catalog texts, I keep a box of titles in the studio in a plain hand built hand painted simple box. In this box are snippets of poetry, street names, sections of novels, and assorted words and phrases that seem to happily come my way. Recently while reading an email from a friend in the country, I realized that in her haste to write out the email she had somehow written the following “ever nice the last time you were looking for him.” This was a somewhat unintentionally oblique sentence that hinted at a meeting of two people, but poetic and somewhat hard to decipher at the same time. This is what I liked about the line! 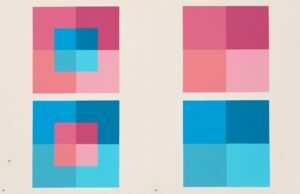 It reminded me of abstract painting in that a certain painting moment or phrase or form can allude to one thing and then another and then yet another. 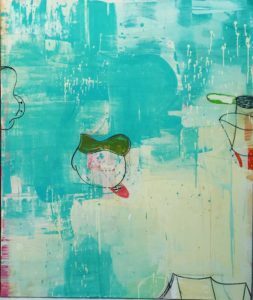 In an abstract painting, such overlaps and incongruities are part of the delight and charm and beauty of the piece, not the opposite. Complete clarity is not the desired goal at all. Hence this line, so very simple and poetic made its way to my hand painted box of titles and will soon marry a particular painting that may yet not have been brought as yet to life. I am quite thrilled to be doing an exhibition by invitation for the first time in my career of the cakes. This exhibition to open January 13, 2018 was curated by James Salomon in New York. 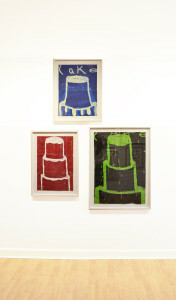 I have been doing cake paintings on paper and canvas since 1996 when I first showed with Jean-Michel Basquiat in New York. This exhibition is titled: Cakes Stacked / Stacked Cakes: From 24 Cakes at Kit Mandor. The cakes developed organically over time and were never ‘directed’ or intentionally or theoretically developed. It happens that my father was an architect who trained in Europe and worked in New York, while my mother, who was a Viennese writer, baked a good many taste cakes while we were kids growing up in New York. The cakes therefore are a marriage of sorts between the architectural and the domestic. Barry Schwabsky, a New York based writer and art critic had written that the he felt that the cakes were more architectural than they were about something ‘sweet’ and that the armature of the cake, in a similar fashion to Josef Alber’s squares and Mark Rothko’s floating cloud shapes, allowed me to play with color and space, and the tension and/or harmony between the two; i.e. the armature of the cakes and the variations on color of armature and ground was what kept the cakes alive and intriguing. One never knows which way the brush will drip, whether the paint application will be a bit thick or a bit more liquid. The drawing may be thick and sluggish of rail thin and moving fast, but for me, the magic and the mystery continues to be that while I may start a painting knowing it will be a cake, I never really know how the cake will come out. We all wait in suspense. On receiving the news that one of my paintings has been acquired by this most respected museum in Rome, was needless to say quite exciting after painting these many years since I first showed my work with Maxwell Davidson in New York in the late 70’s. 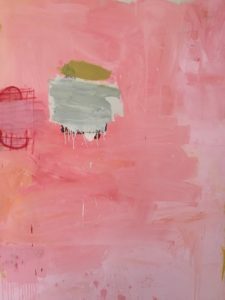 This museum in Rome has acquired a painting titled: ‘In Which the Baron Fallow’ 60 x 48”, which was first shown in a catalog exhibition by invitation with Robert Motherwell in Dublin. For a painter it is quite important to be recognized thru one’s career by significant museums and art institutions. 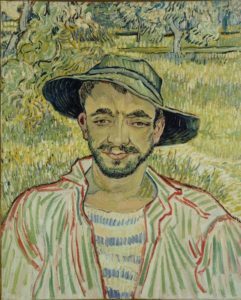 The Galleria Nazionale d’Arte Moderna has a collection that is widely respected worldwide and includes works by Cezanne, Monet and van Gogh – as a highly respected collection of contemporary living artists. It was certainly a thrill to receive this good news and such good news keeps a painter alive and motivated and hungry to move forward with the ongoing thrust of one’s career. Many architects and viewers of architecture focus on the finished products, the finished building or structure, which makes sense, but not fully appreciating the beauty of the work in progress, i.e. the scaffolding, the timber frame construction and for me, in particular, the interior sheetrock installation before its final coat of plaster is applied. The bones of architecture, i.e. the necessary armature that essentially holds up each and every building is a fascinating amalgam of skeletal parts that crisscross in many directions all stabilized with nuts and bolts and yet stronger attachments to provide stability on all levels. A simple barn or series of barns as are being built as I write this by the Alexander Calder estate just up the country road from my studio is all hand cut beams, wide and thick and fresh in scent from the axe of the wood cutter. All post and lintel, no nails and as elemental as anything the shakers in western Pennsylvania had built in the past several centuries, as pure as a Japanese low ceiling ryokan in Kyoto, Japan. 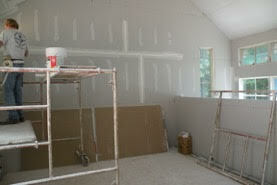 Sheetrock and scaffolding in my studio build out. For me, the early beauty of a freshly sheet rocked wall holds great visual and tactile interest. The separate sheets of sheetrock which are wide and flat are nailed or screwed to the attendant studs or beams, then slapped with a layer of mud or spackle the consistency of pudding and scraped and scraped again to lay flat. This is done several times with an addition of paper tape to seal any gaps that may appear. For me this early stage of sheetrock application with its taped and bedded formulations has an unexpected beauty. This underlay is soon lost visually as a final coat of paint is applied. I have done a number of large paintings, that utilize or loosely reference this sheetrock component for its intrinsic and honest beauty. The beauty of it all is that this stage of construction is not meant to be seen, and yet a Komarin painting reveals this moment in time. A very brief one, now not lost but held in time forever on the fresh canvas for all to see. 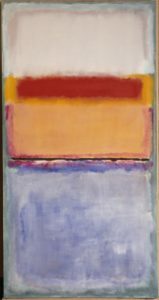 Many collectors wonder about the use of forms and formlessness in contemporary abstract painting. 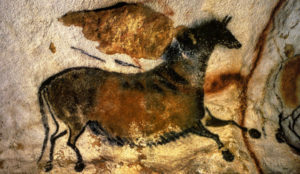 Throughout the history of art, painters would generally paint forms in space whether they were bison and antelope, Jesus on the cross or a cow grazing in a meadow under an azure sky. This made good sense, as a painting was painted to tell a story and the story depending on the depiction of forms in space whether those forms were painted large or small, clearly or less clearly, but overall the forms existed and were meant to be seen. 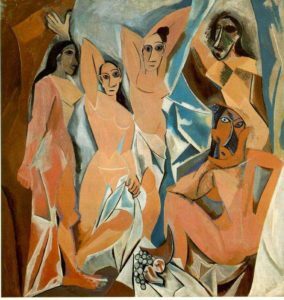 Abstract painting in the beginning of the 19th century, and with Picasso in particular leading the pack, painters began to break up forms and questioned the integrity of form. 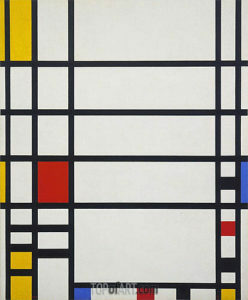 Partly as a result of experiments in physics wherein physicists began to see that forms were less stable than expected, composed of smaller particles that were themselves forever moving in space and these theories were somehow in the ether and painters being intuitive and tuned in, generally speaking, picked up on this issue of form and formlessness. 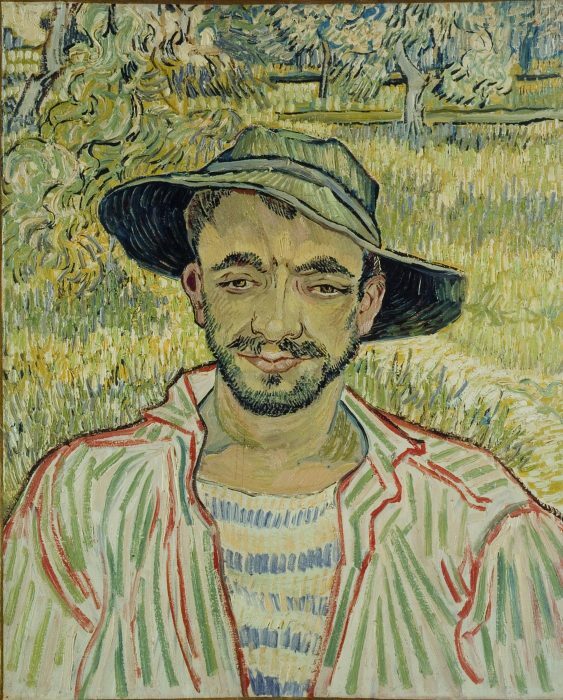 Cezanne in the late 19th century began to break up forms whether they were human or trees or rocks and Picasso and Braque in Paris continued these explorations with analytic and synthetic cubism. Following this in the mid-20th century Jackson Pollock and Mark Rothko further exploded forms in space, Pollock by dripping paint across the large surface of canvas he placed on the floor of his studio in East Hampton and Rothko by applying thin layers of paint, layering one color over another to dissolve form and create abundant and terrifyingly beautiful mystery. Komarin also paints forms and breaks them up as did Philip Guston and Cy Twombly. 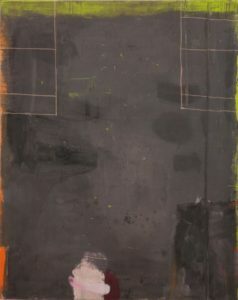 In a Komarin painting, forms are drawn and painted in a quite intuitive manner and often destroyed and moved around. They become more and then less form, and Komarin is open to the interpretation of these forms. The painting has a life of its own, and the forms populate that painting to varying degrees. The great mystery and magic of painting is that they can continue to move and explore after the brush is put down, the lights turned off and the studio door closed. 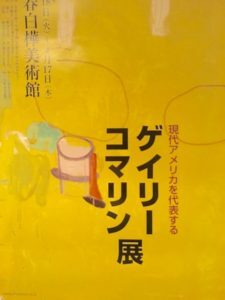 Nearly ten years ago, I was invited to have a solo exhibition at the prestigious and privately owned Musee Kiyoharu in the countryside of Japan. 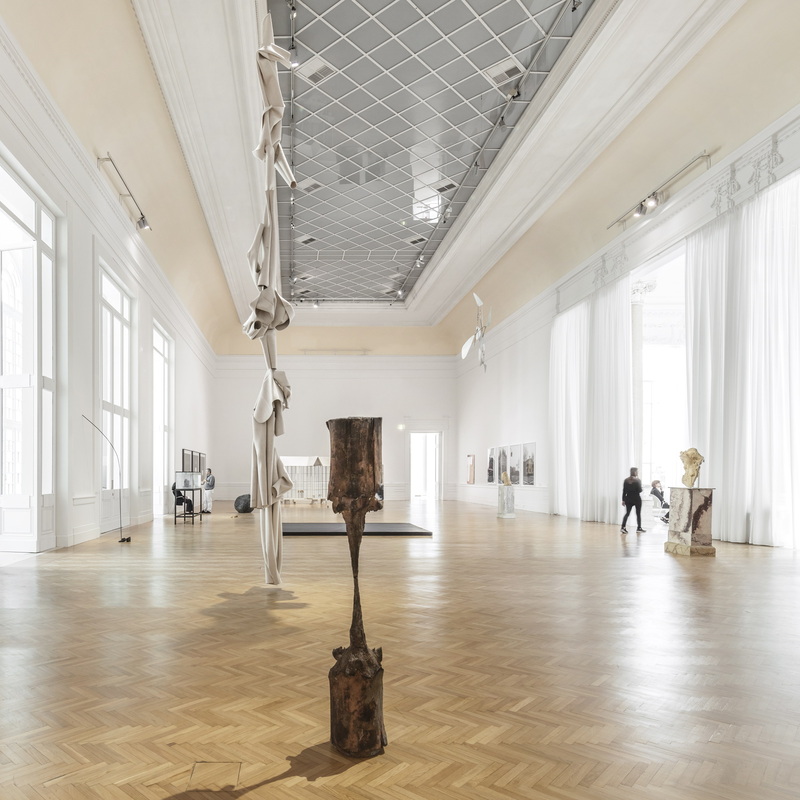 This is a pivotal and quite important exhibition for me as the exhibition was by invitation only, through the auspices of one of my Asian collectors who was in turn well connected with the owner of the museum who was a major collector in his own right. 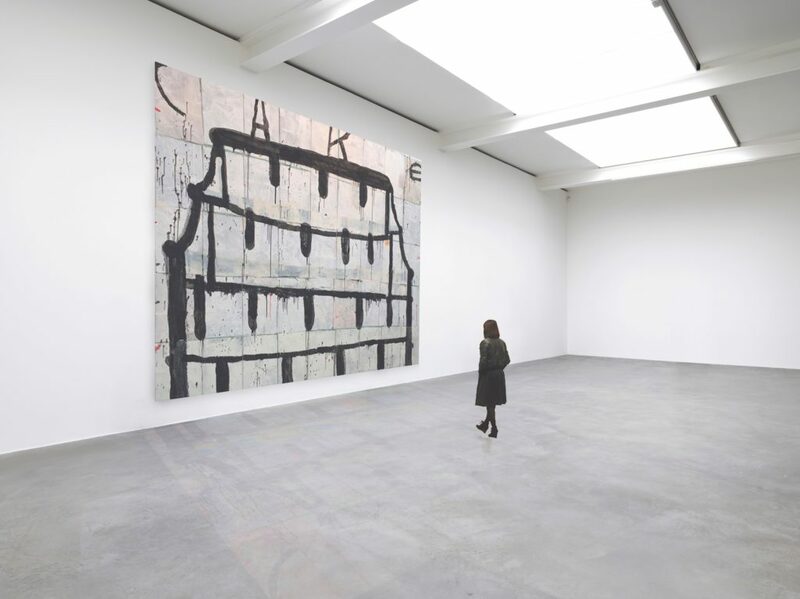 The show featured approximately twenty-five large works on canvas. The exhibition was titled: ‘Moon Flows like a Willow.’ The title came from a poem that my son Wyatt wrote when he was only 8 years old it had a beautifully oblique and resonant quality for me and also dovetailed very well with the Japanese fondness for willow trees and nature itself. We flew to Tokyo and took a train to Kyoto and from there a taxi to get to the museum which was set in the countryside of Japan which is quite extraordinary with its swaying bamboo trees, most much taller than any I had seen in America. They bend in the wind in the most magical fashion. 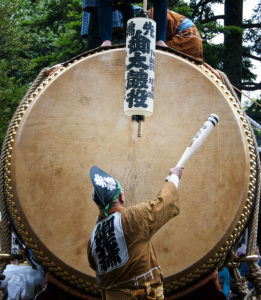 The show was a big success, widely reviewed in Japanese press and was followed by an outdoor concert featuring huge kettle drums that were played loudly with long wooden sticks. Promotional poster for ‘Moon Flows like a Willow’ at Musee Kiyoharu. Painting, especially abstract painting, speaks to all people. 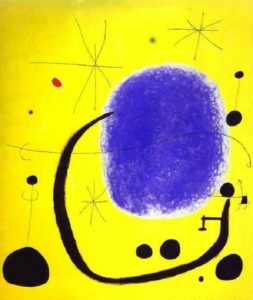 The voice of abstract painting speaks to all languages and language in a curiously happy way drops out and viewers can appreciate color, tone, texture and shape free from the limitations of language the painting speaks. The people dance. The drums play on.